We sell Aloe Dent products like AloeDent ® Sensitive Toothpaste 100ml online in the UK and directly from our award-winning store in Scotland. With soothing Aloe Vera and Echinacea for a special sensitive formulation. We sell real Aloe Dent and other Toothpastes directly from our shop in Scotland and online throughout the UK. View more products from Aloe Dent. Where can you buy real AloeDent ® Sensitive safely online? If you are wondering where you can buy AloeDent ® Sensitive Toothpaste 100ml safely online in the UK, then shop with us. 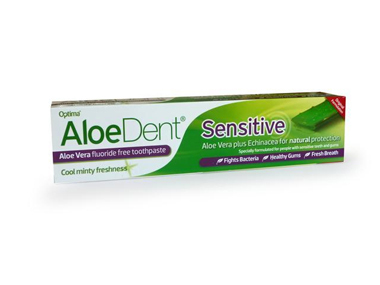 AloeDent ® Sensitive - AloeDent ® Sensitive Toothpaste 100ml in Toothpastes and Dental Care.